We send parcels overnight* to NZ addresses, and we send by Airmail, Economy Courier and Express to most International destinations. It is a flat-rate of $5.00. WHAT IS THE TARGET DELIVERY? In a nutshell...Overnight (Mon-Fri) to town addresses, and to rural addresses 2-3 days more. Our personal target is to dispatch orders if they've been placed and paid for before the daily cut-off of 2pm Monday-Friday, on the day you place the order. Courier Post's target time-frame for delivery is 9am next working day (Monday to Friday) for business addresses and 5pm next working day (Monday to Friday) for residential addresses (but it's often sooner in the day). NB; There is no same-day or same-day evening service running out from New Plymouth which is where we are based. CONCERNED THERE'S BEEN A NON-DELIVERY? 9 times out of 10 with customer's calls around non-delivery, the item has actually been delivered. 1. Go to your emails and check the tracking information we sent you at the link to Courier Post's site. Their system requires the driver to be located by GPS, so the scan time of delivery is accurate, and the location can be checked by one of their investigation team. The tracking information will tell you if Courier Post have it recorded as delivered or not. 2. Make sure you have read this page. 3. Check all around your property (under hedges (if it's been windy), in the letterbox, under the BBQ/potplant, in the garage, round the back deck). 4. Did someone else bring the item in and put it in a safe place (the passenger seat, top of the fridge, mud room) and not tell you? Occasionally, due to bad weather conditions or unforeseen delays in delivery, items may arrive to you later than expected. Please read our terms and conditions. Finished putting everything in your Cart? Great! $0.00 Your Airmail is FREE! NO TRACKING SERVICE is available for this sorry. *Occasionally delivery takes place outside of these target ranges. Please understand that these are target time-frames, not hard and fast rules! Insurance/cover is included, but only up to the value of NZD$250. Additional Insurance is optional, costs $10 at checkout, and provides cover up to the value of NZD$1500, in the unlikely event of loss or damage. Please read our terms and conditions. 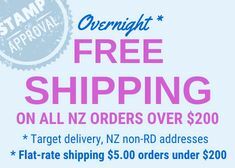 For all Airmail orders under the value of NZD$250, insurance/cover is already included in the cost of shipping. It covers you in the unlikely event of loss or damage to your parcel, up to the value of NZD$250. For all Airmail orders to the value of NZD$250 or more, additional Insurance is optional and costs NZD$10, its available at checkout. It provides cover up to the value of NZD$1500, in the unlikely event of loss or damage. For all Economy Courier and Express Courier shipping, insurance is included for orders up to the value of NZD$2000. Please read our terms and conditions. Most international orders are processed promptly on the same day if your order is received by 2pm Monday to Friday. Once an item has been dispatched from our premises we will give you confirmation via email that the order has been processed and sent. Please read our terms and conditions. Small orders for personal use usually would not incur any additional charges, taxes or other procedures on arrival in your country, unless there is a flat-rate charge such as GST on all imports. Please contact your local Customs Office or Border Services for clarification. ...is that our loose crystals, rhinestones and beads are classified as 'glass beads' in the 10 digit Harmonised Customs Tariff Schedule. (They are NOT classified as jewelry or semi-precious stones, which is an entirely different classification, starting with 71, not 70.) (In Canada for example, the correct tariff # for rhinestones and beads is 7018.10.00 20. In the USA it is 7018.10.20 00. In the UK it is 7018.10.51.00.) Therefore, they are tariff free and should incur no duties, but if you are worried and need to clarify, get the word from your local Customs Office or Border Services for sure, quoting them the correct tariff number above so that they don't automatically assume it is jewellery or semi-precious stones when you say 'rhinestones'. We clearly state on all customs stickers and documents the harmonised tariff number and the country of origin. ...when you choose to have your parcel sent by Airmail or Economy Courier, our postal system will deliver your parcel straight to your country and it will go immediately to your country's customs. If any clearing needs to be done or duties need to be paid (eg, because of the value for example) they will contact you, the addressee, and it will be your responsibility to comply. That is why we strongly advise being knowledgeable beforehand with a simple call to your local Customs Office or Border Services for information ahead of time, armed with the 10 digit Harmonised Customs Tariff number. When you choose to have your parcel sent by Express Courier, your parcel will be handled by DHL from beginning to end, delivered by DHL to you in your own country. DHL will contact you to advise if there are any customs clearances or duties to pay, and can usually do this service on your behalf if you wish for them to do so, or put you in the right direction of someone who can. Again, we strongly advise being knowledgeable beforehand with a simple call to your local Customs Office or Border Services for information ahead of time, and then a call to DHL or a customs broker, armed with the all important 10 digit Harmonised Customs Tariff number, so that you know what you can expect. ...we cannot recommend enough the value of contacting your local Customs Office or Border Services and chatting with them about your intentions and what you need to expect and know from your end. We have found this to be the best way to know how it gets handled, and what to expect, once it hits your border. However, knowing the 10 digit Harmonised Customs Tariff will allow you to already armed with knowledge and it will be a specific assistance to them to help you accurately. We send with New Zealand Post (and for Express Courier sending, NZ Post use a third party contractor: DHL). NZ Post is a reliable and trusted delivery service that we've used for over 20 years. You can expect that your item will usually arrive at its destination within the target timeframe specified for each service. Please allow as much time as possible for delivery. As New Zealand Post doesn't directly control all parts of the delivery chain, it can't be guaranteed that your item will always reach its destination within the delivery target, most especially with Airmail, but the options of tracking are available with Economy Courier and Express Courier, so you have good options there. Delivery to areas outside major cities may take longer, or your local postal service who handles the domestic delivery of your parcel may be experiencing a backlog for example, or they may even be on strike! Other delays, once a parcel leaves our premises, can sometimes occur, although very infrequently. We do not accept responsibility for any delays or their subsequent consequences. Please read our terms and conditions.